Bangalore based Subhashini Vasanth, disciple of Vyjayantimala, formerly trained under late Guru Narmada, gave a Bharatanatyam performance at Chowdiah Hall on 21st October under the aegis of Vasantharatnam Foundation for Arts. Vyjayantimala conducted nattuvangam for Subhashini. It was for a noble cause. The Foundation was established ten years ago by Subhashini in memory of her late husband, Vasanth Venugopal, Col. of the 9th Maratha Light Infantry regiment. He was martyred fighting with terrorists at Uri in Jammu and Kashmir area. With his troupe he had succeeded in eliminating all the terrorists before he was killed. He was awarded the Ashok Chakra. Subhashini was devastated. Overcoming her personal tragedy, she decided to establish the Foundation to empower the martyrs' families, by providing them financial assistance, extending its scope by offering educational grants to children, memorial awards to schools, where martyrs' children study, birthday gifts, empowerment programmes for the women, skill building workshops like computer and English classes etc., in collaboration with Pegasus Institute, Samvada, and Anekataa. 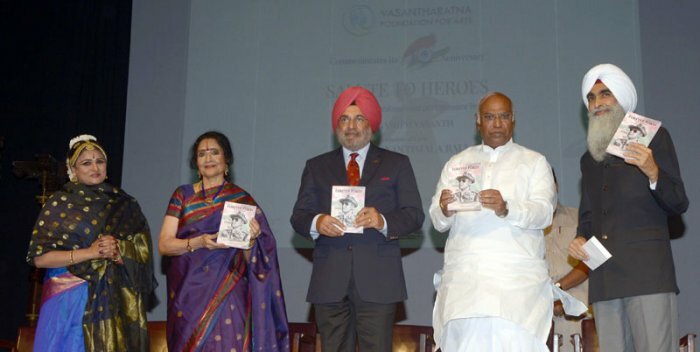 Salute to Heroes was started as a platform for arts, mainly to fund raise and to build awareness of the sacrifices of the soldiers among the civilian community. Celebrating a decade, the Foundation announced that they would reach out to the families all over India and not limit to Karnataka only. In this endeavour, all the way from Delhi came General J.J Singh, COAS and Governor of Arunachal Pradesh, Mr. Kharge, Congress Govt. 's leader of opposition in Loksabha, Mr. Chiranjeev Singh, former Ambassador, and extended financial support. Mr. Singh gave a cheque of Rs 1 lakh from Masti Venkatesh Foundation and Mr. Kharge announced Rs 2 lakhs for the Foundation. Several other supporters also donated various sums. General J.J.Singh observed that martyr's wife termed as ‘Vir Nari' does not need pity. She deserves to lead full life, discover her true potential and make her and her loved ones' lives brighter and more successful. For her work, Subhashini has received the Neerja Bhanot award. A successful Bharatanatyam dancer with two daughters who also perform Bharatanatyam, she firmly believes that education and empowerment through arts is an effective means of reaching out to people across the country and creates support system - not only financial support but also emotional support. Through the Foundation, she has succeeded in establishing liaison between civil agencies, the Govt. and next of kin of martyrs. Subhashini mentioned that for past two years she was not performing and was feeling very low. Vimala Rangachar, a close friend of hers and of Vyjayantimala, suggested that she could study under the veteran. On learning about Subhashini's Foundation, Vyjayantimala agreed to train her. For more than past one year, Subhashini has been studying under Vyjayantimala, the Tanjore bani, as she has studied under Kittappa Pillai, a descendent of Tanjore Quartet. Subhashini's late Guru Narmada had also studied under Kittappa. Thus there is a continuity and direct lineage of the bani in her dancing. This was also for the first time that Vyjayantimala was conducting nattuvangam with her musicians in Bangalore. The program Subhashini presented had a distinct style of Vyjayantimala. Right from Alarippu, Subhashini revealed her mastering the technique with perfect basic stance. Vyjayantimala had designed a simple costume for her disciple. The style known for its architectonic beauty, straight lines and geometric perfection helped to highlight the grandeur of nritta. Unhurried movements in slow tempo were a delight to watch. More of a feeling of peace than razzle dazzle, it created aesthetic beauty. Gopalakrishna Bharati's Devi Kriti in Jaganmohini raga and roopaka tala saw Subhashini creating iconic image of the goddess. The epithets Anandi, Jaganmohini, Adi Paratpari, Shankari, Paramakripa katakshini, Balakrishna Sahodari, found felicitous expressions. In the final stance when Subhashini wielding trident attacked the demon, there was shower of flowers from the heaven as the gods celebrated her victory. That was an imaginative and interesting touch. Vyjayantimala is known for Swathi Thirunal's Suma Sayaka varnam in Kaapi raga as she has learnt from Kittappa. The delineation of the bhavas with alternating nritta passages with exquisite laya was indeed a tour de force. The nayika's agony conveyed to Lord Vishnu with his four arms holding Sudarshan Chakra, Conch, Lotus and Gada, the mace, the flowery arrows Kamadeva aimed at her, the resultant pain caused to the nayika, unable to listen to cuckoo's singing, notes played on veena, losing appetite et al were depicted with suggestion and dignity. Kamadeva's turning into ash by Lord Shiva and the request of Rati to Lord Shiva to bring him alive was performed suggestively minus exaggeration. Sakhi requesting the lord reclining on Shesha, from lord's nabhi sprouting of the lotus in which resides Brahma and hence addressed as Padmanabha, had a poetic touch. Offering her pranams to Sarasiruhanabha, the lord, Sakhi beseeches him to have compassion and go unto the nayika. The swara, solfa passages were lilting enhancing the musical genius of Kittappa. The content and the form were internalized by Subhashini in a delectable manner. Much loved and commonly shared by majority of Kannada speaking rasikas, Purandaradasa's Rangayya devarnama was received with spontaneous rounds of applause. Set to Ragamalika and adi tala, it covered the succor the lord extended to Kari Raj, the elephant, when he was caught by crocodile, Draupadi when she was humiliated by Dushasana disrobing her and when childhood friend Sudama went to see Krishna with puffed rice as gift. The abhinaya was subdued minus melodrama and was appropriate, full of auchitya, as it should be. The poet addresses the Lord: Saptagiri Venkatesha, Sarpashayana Shri Purandara Vitthala, evoking bhakti. Subhashini's rendering was replete with bhakti. Tillana in Suruti and adi tala by Mysore Vasudevachar captivated the nuances of raga with movements that caught attention for its simplicity. 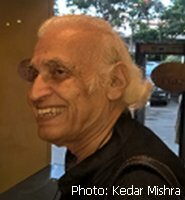 Muthuswamy Dikshitar's composition as Mangalam in Vasanta raga generated the auspicious feeling of shubha mangalam, permeating the finale. Watching Subhashini's performance one experienced a feeling of shanta rasa, quietitude which springs from meditative quality and less of speed and cascades of teermanams. Such a performance left an impact, resulting into rasanubhava. After the performance, a short film on Vasantharatnam Foundation was screened with Amitabh Bachchan's commentary and an appeal to support the Foundation. The dignitaries applauded Subhashini's performance and the work of the Foundation extending full support. The Kannada version of For Ever Forty book was also released on this occasion.